Apple's shiny new baby is about to slide out of the womb, and if you're a Mac user, it'll take over your computer soon. New features abound, but OS X Mountain Lion is missing some awesome stuff Microsoft has cooked up in Windows 8. Apple: copy this. Mountain Lion is plenty proud of its ability to blow up windows to fill your display, a la Windows over a decade ago. It works, in that the apps do expand to the further possible edges of your screen. But it's goofily implemented, clumsy in appearance, and doesn't really help you do things any better. Full screened apps in Mountain Lion push everything else out of the way, forcing you to slide between multiple desktops if you want to look at more than one thing at a time. We're all about maximizing pixel real estate, but only in a way that makes sense. Filling a screen with a slim white word processor and fat black bars isn't maximizing much of anything. Windows 8, by comparison, makes the most elegant and satisfying of screen space we've ever seen in any operating system. Not only are Metro's apps super-graphical and downright pretty—lending themselves to big screen loveliness by design—they're flexible. When you use a full screen app in Metro, you don't get the sense that you're hastily sweeping everything off your desktop with a crash, as one does in Mountain Lion. Rather, apps only take up as much space as makes sense—and you're in charge of that. It's your software. It's your computer. They're your eyeballs, your brain. Make the four dance together at will. Want the Windows 8 weather app to take up your entire screen? Go for it. Want to check your email on the side? Pull up a smaller panel of your inbox, and check it in your periphery. Go ahead, swap the two, making weather the appetizer and email the entree. It doesn't matter. Fling and resize apps however you want them, whether it's to isolate one against distraction, or combine two into a multi-pane billboard of efficacy. Windows 8 makes full screen about far more than just stuffing your screen—and it's time for OS X to catch up. Remember when Apple was the one with the reputation for chic, daring new visuals, and Microsoft was the stale, frumpy crone? The wheel of fate has turned, putting Apple in the fashion victim column and Microsoft—Microsoft!—of all companies, in the avant garde. Windows 8's Metro aesthetic is like nothing else we've ever seen. It's a large part of why we adore Windows Phone so much, and it's what makes Windows 8 look like an operating system from the future. It's superflat, colorful without being garish, as clean as we can imagine, and entirely modern. It embraces the fact that it's a digital interface on a computer, while at the same time hugging you as a user. OS X, on the other hand, is starting to look confused. Grey gradients, translucent docks, shining icons, more gradients, stitched leather—Christ, the stitched leather. OS X has become a mish mosh of competing design ideas. Should your computer look like the things around you? Should iCal resemble a real calendar? Or should software look futuristic and virtual—like, y'know, software? 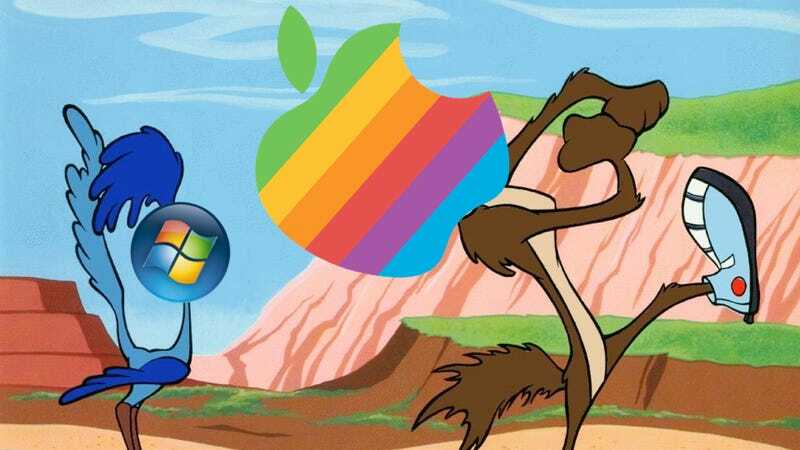 Apple doesn't have a consensus, and Mountain Lion is the shrug of an answer. There's too much going on, a scattershot of design, rather than a consistent ideology a la Metro. It's distracting and turgid. Yes, Apple needs to copy Microsoft's design. Get over it—this isn't a joke anymore, it's a strange computing reality. Pinch to zoom, swipe to slide, twist to rotate—these are a given now. The standards. Every phone has them, every tablet at least attempts them, and they're no longer considered an achievement of modern navigation. Touch can be more than just the easy stuff, and Windows 8 makes this clear. Take Microsoft's "semantic zoom"—which sort of amazingly changes how we've ever thought of "zooming." Rather than just making something larger, as is the case with OS X's zooming gestures, Windows 8 allows you to focus or pull out on levels of information detail. Look up there—"zooming" into the Windows 8 calendar app "zooms" you in time, rather than space. You're getting a more detailed look at a given week, or day, or hour. This info-zoom is spread all over Windows 8, and should be standard for a Mac too. Imagine clicking an iMessage contact and zooming into her address book info, pulling back from an iPhoto album to see metadata plotted across a map, or being able to rapidly sprint between folders on your hard drive, making file hierarchy less of a labyrinth and more of a wormhole. Microsoft is doing more with touch than Apple. It's being more creative. Apple: don't lose your lead. You made this stuff mainstream. Typing passwords with "words" and "letters" is bo-oring, and not always enough to keep your gear locked down. So Windows 8 throws in image "passwords," which let you tap or swipe certain prats of a picture to prove you've memorized something and deserve access. Is it enough to replace text passwords entirely? Maybe not, but it's a clever way of making security more secure without being obtrusive in the slightest. iCloud is okay, but there's an enormous thing it's not doing: giving you a remote hard drive that no crook or act of God can touch. Microsoft's SkyDrive storage is baked right into Windows 8, giving you the option to offload your stuff where it'll be safe straight from the OS. iCloud can't do this—instead, you'll have to use a third party service like Dropbox. Dropbox is good, but if Apple adores its cloud so much, shouldn't it do the most obvious thing possible? Let us save to iCloud, drag and drop to iCoud, and generally pack as much stuff as we want into that fancy drive in the atmosphere. And maybe consider matching Microsoft's free seven gigs of space. Yeah, it's a dumb name. Whatever. Windows 8 sports a hidden toolbar that pops out from the side with access to search, settings, sharing, and other quick-trigger actions. Apple, make Mountain Lion's notification bar more than just notifications; give us shortcuts to the guts of the OS that need frequent changing. So go forth, Cupertino. Windows spent the past two decades ripping you off as often and flagrantly as they pleased. Do us all a service and return the favor.